This site is for nature lovers and gardeners who are interested to learn more about the butterflies that may visit a Dorrigo Plateau garden. You can also read what makes a butterfly paradise. We plan to continue to expand content as new species are discovered here. Dorrigo is a small town on the tablelands of Northern New South Wales about 550k north of Sydney, NSW and approx 450k south of Brisbane, Qld. Every butterfly included has been sighted on our Dorrigo Plateau property (approx 800 metres above sea level) at some time since 2005. A small number of these butterflies we were unable to photograph and temporarily have used other photos available to us. Of the 435 recorded species of Australian butterflies (mainland & island territories) we have identified 83 here as at January 2019. We will show you some caterpillars (larvae) and chrysalises (pupae) to help you more fully understand their life cycle. If you gain enjoyment from seeing beautiful butterflies in your garden knowing how to protect and care for their early stages is very important too. 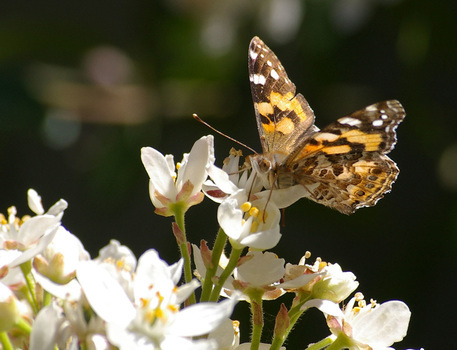 ​The Butterfly Banquet page will show you how to encourage butterflies to visit your garden and stay a while. The photographs (unless otherwise labelled) are ours and are taken on our property. The information is mostly from our own experience but includes some from the books listed on the Butterfly Gallery page. ​The News page is updated periodically. Happy butterfly gardening and spotting! ​As conservationists our butterfly collection is in the form of photographs. With digital photography the days of amateur enthusiasts having to kill butterflies and pin them in a collection have gone. ​Today everyone can create an exciting collection of natural butterfly moments in the form of photographs leaving these beautiful insects to fly free and continue to reproduce offspring. We think it important, for future reference, to keep records of our butterfly sightings and mostly keep these on a monthly basis. However with less common species we record how many times we sight them within the month as well. The full value of such data will only be known in the future when another enthusiast attempts to learn how each species is fairing in the conservation stakes. ​In addition to butterflies we are also interested in the study of larger moths, in particular Hawk Moths. Because of our deep interest in Hawk Moths we have extended our photos to include some we have photographed elsewhere in Australia - to ensure this does not create confusion we clearly show the location of each Hawk Moth sighting. Several contacts have also kindly supplied photos. In addition we have included some of the other Plateau moths photographed on our property to give an idea of their beauty also. We give our warmest thanks to all who assist us over time either with the provision of photographs or by willingly undertaking reviews of our work helping to verify that the content of our website is correct. We are particularly indebted to Trevor Lambkin and Kelvyn Dunn for their expert advice on butterfly identification, especially the difficult Skippers and Blues; to Phil Gilmour for being a constant source of expert advice on botanical matters as well as being a good butterfly spotter and to the other members of the Lepidoptera Group of N. E. NSW (TLCG) Mick Andren, Doug Binns, Peter Richards and Ross Macleay. Also to John Ross & Darren Moffatt for their assistance with butterfly information and to all our family and friends for helpful comments on layout and typos.